The City of Cleveland Department of Economic Development provides technical assistance, creative financing and educational opportunities that will ensure a vibrant economic future for the region. 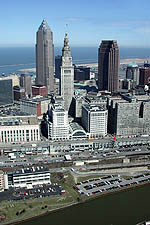 Its mission is to provide assistance to businesses expanding within or relocating to the City of Cleveland. This includes financing, workforce solutions and technical assistance that will encourage investment in the community to enhance the lives of Cleveland citizens. The Department works in concert with other departments in Cleveland City Hall, as well as with several local and regional partners. To provide assistance to businesses expanding within or locating to the city of Cleveland including financing, workforce solutions and technical assistance that will encourage investment in the community to enhance the lives of our citizens.